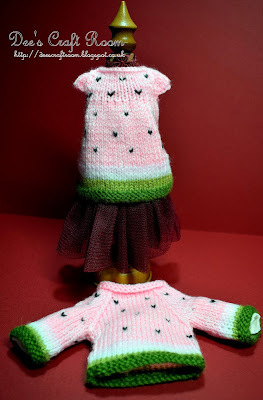 Day ten already with my personal challenge to make 25 dresses and jumpers to fit my niece's Christmas elves. I have another pair of matched designs today. I know it is not a Christmas, or even a winter design but I could not resist. The dress is another of Suzymarie's variations of the Julie Williams 'Seasonal Dresses' pattern and and I used her 'Seasonal Sweaters' pattern. As you will know by now, the original pattern was designed to fit the 'Little Cotton Rabbits' series of soft toys. 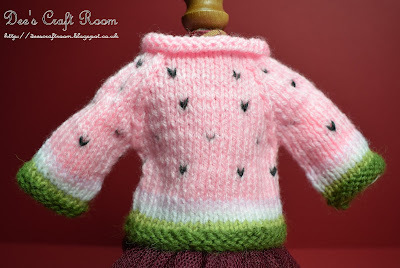 The original patterns were written for 4 ply but as the elves I have been knitting for are a little larger than the Little Cotton Rabbits I have made mine in baby soft double knit and alpaka double knit. 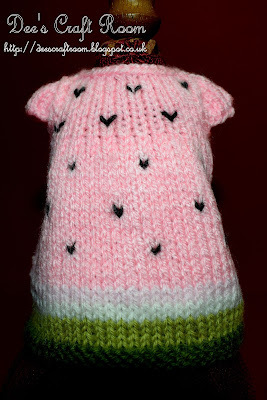 Suzymarie has called this design 'Watermelon'. The little black stitches are meant to represent the watermelon pips, they have a nasty habit of disappearing into the main colour and with hindsight I wonder whether I should have tried embroidering them on with 'Swiss Darning'. I have only ever tried doing this once before and I was not very good at it. As before, after making the dress I re-worked the dress pattern to get the stitch chart for the jumper. I am amazed you spotted the lighter pink. It is such a great design, all the layers and the subtle colour changes. 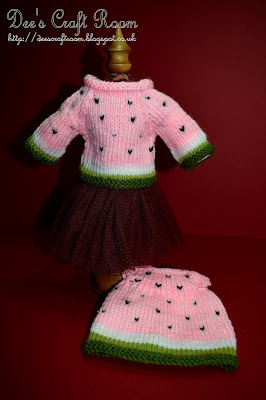 It is also sooo girlie, my niece will love that about this one. Such an adorable design. Great colors too! Thank you, I know it has nothing to do with Christmas but I found this one irresistible.